Artist's impression of NASA's Messenger spacecraft in orbit at Mercury. Messenger arrived at the solar system's innermost planet in March 2011. A NASA Mercury probe isn't ready to finish its groundbreaking work at the solar system's innermost planet just yet. Last week, NASA's Messenger spacecraft executed the first of a series of engine burns designed to lift the probe's orbit slightly and delay its inevitable impact into Mercury's surface by up to a month. If everything goes according to plan, Messenger could keep observing Mercury through April 30 or so, mission team members have said. 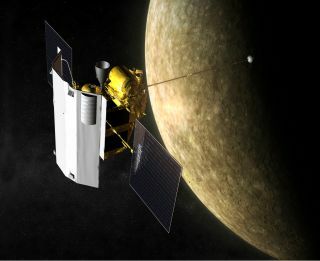 The $450 million Messenger mission, whose name is short for MErcury Surface, Space ENvironment, GEochemistry and Ranging, launched in August 2004. After taking a circuitous route through the inner solar system, in March 2011 Messenger became the first spacecraft to orbit Mercury. The probe has achieved a great deal in its four years at the planet. For example, the mission has constructed the best-ever maps of Mercury, and it also discovered carbon-containing organic compounds and water ice inside permanently shadowed craters near the rocky world's north pole. Messenger is currently operating on an extended mission, and the spacecraft is almost out of fuel. When its tank is empty, Messenger will succumb to the force of the sun's gravity and spiral down to its doom on Mercury. The probe's handlers want to wring as much science out of the mission as possible — hence, the current sequence of orbit-raising maneuvers, which seeks to extend a low-altitude "hover" campaign designed to get great close-up looks at Mercury. Messenger's final days of operation will prioritize observations made by the spacecraft's magnetometer (MAG) and neutron spectrometer (NS), mission team members said. "With NS, scientists will hone in on shadowed craters at northern high latitudes to search for water ice. We have found such evidence previously in the mission, but we hope to find more at low altitudes and spatially resolve the distribution within individual craters if we are lucky," Messenger Deputy Project Scientist Haje Korth, also of APL, said in the same statement. "With MAG, we will look for crustal magnetic anomalies," Korth added. "Establishing the presence of crustal magnetic anomalies on Mercury would be a huge result, because it would extend the known temporal baseline for Mercury's internal magnetic field by eight orders of magnitude." Last week's 32-second engine burn, which occurred March 18, increased Messenger's closest-approach altitude from 7.2 miles (11.7 km) to 21.4 miles (34.5 km), mission representatives said. The next such maneuver is scheduled for April 2.